April 6, 2016, marks the 99th anniversary of the U.S. entry into World War I. 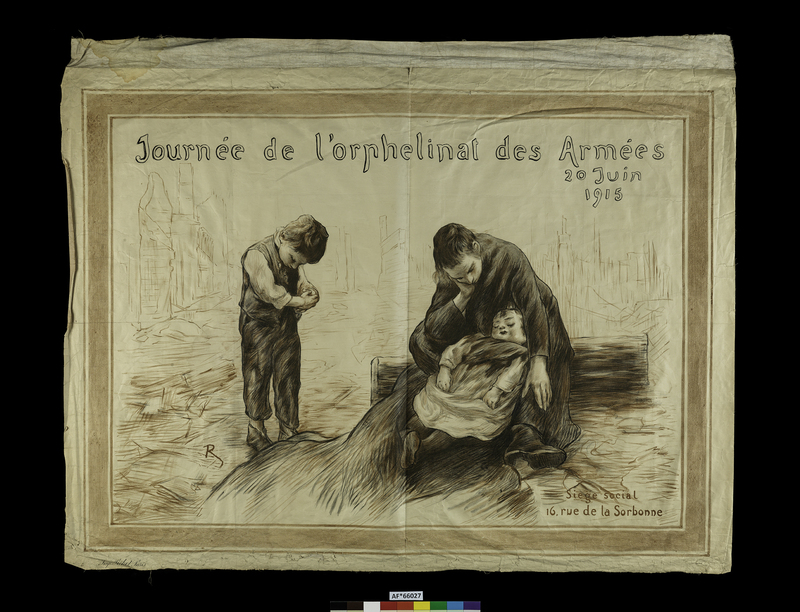 Although the country would not be drawn into combat until April 1917, the war and its atrocities rallied philanthropic feelings in Americans early on. We explore three stories of Americans who aided the Allies prior to formal U.S. involvement. If you’d like to read more World War I stories, check out our newly launched World War I topic page, bringing together content from around our web site. —Excerpt from letter sent by a young French girl, Antoinette, to her American “godparent,” one of the many who supported the Fatherless Children of France. The organization matched a French child with an American godparent who provided the child with 10 cents a day (the equivalent of about $2.35 in 2016 dollars). These funds had a special purpose: to keep war-torn families together. The stipend helped widowed mothers afford to raise their children rather than be forced by poverty to surrender them to orphanages. At the outbreak of World War I in 1914, future U.S. president Herbert Hoover was a wealthy mining engineer living in London. After helping thousands of Americans who found themselves stranded and penniless in Europe, he was asked to set up the Commission for Relief in Belgium (CRB). Its main goal was to help feed the starving Belgians. When the German army invaded Belgium (a neutral country) in August 1914 in preparation to invade France, the British navy blockaded Belgium’s harbors in order to cut off German supply lines. However, Belgium depended on imports for 80% of its food supply, and with the blockade in place it could not import any food for its citizens. Hoover was able to negotiate with the British and Germans to let food be delivered to the Belgian people. Besides the all-important food shipments, Britain and Germany reached an agreement allowing the importation of thread and the exportation of lace made with the thread. This effort helped thousands of Belgian lace makers earn money for food for their families. The laces were ordered, inspected, and sold through the London office of the CRB. Hoover’s wife, Lou Henry Hoover, was very active with her husband in helping with this effort. Mrs. Hoover utilized her skills as an organizer to establish a hospital in London, which was supported and staffed by American volunteers, and organized a knitting factory in London. She also showed a keen interest in preserving the Belgian lace industry, which had been well established and world famous since the 16th century. Van Ingen stayed on at Alliance Hospital for a year, working from February 1915 until her return to New York aboard the SS Espagne in February 1916. By September 1917, she would be back in France, this time with the American Navy Nurse Corps as chief nurse of Navy Base Hospital No. 1 in Brest. As we commemorate World War I anniversaries for the next few years, our World War I web content will continue to grow. Take a look to find stories about General Pershing’s pre-World War I career, online exhibitions, and collections. Mallory Warner is a project assistant in the Division of Medicine and Science. Patri O'Gan is a project assistant in the Division of Armed Forces History.